"New product" writeup for the ELLIS adjustable "S" handle wrench describes sizes, finishes, and pipe and nut wrench jaw options. 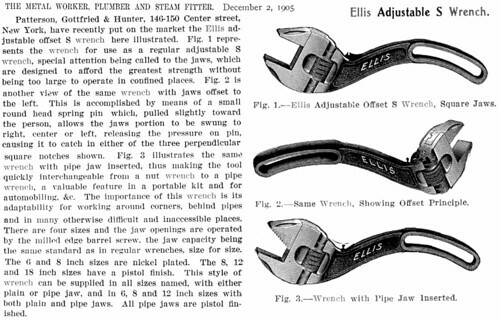 The Nov. 3, 1903 date appearing on examples of the wrench does not correspond to any date associated with patent number 759,869. The pipe jaw equipped version is seldom seen.